During my last visit to Kolkata, I was lucky enough to catch the Nandikar National Theatre Festival which over the years have evolved to be one of the major theatre festivals of India. During the festival, the Academy of Fine Arts compound livens up like no other time. 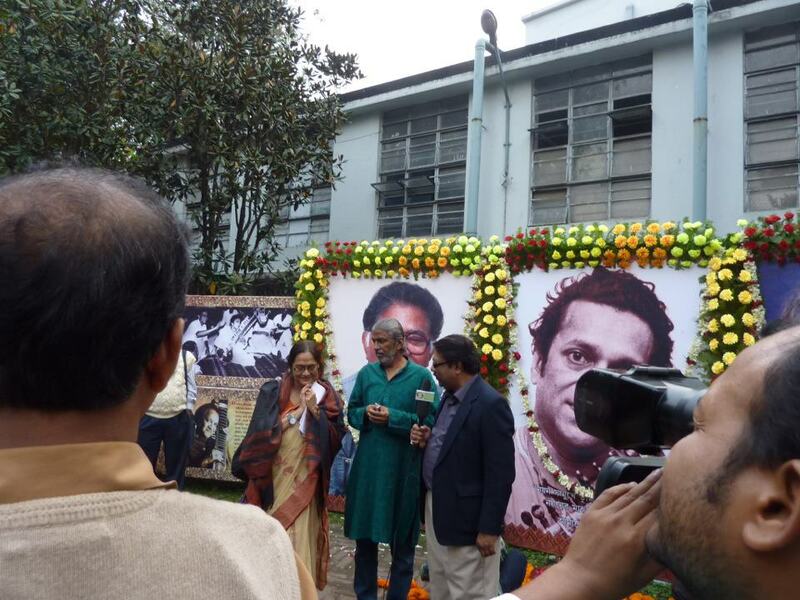 This time Nandikar Festival was dedicated to the memory of the famous writer Sunil Gangopadhyay, playwright Mohit Chattopadhyay, and the great musician Pandit Ravi Shankar, all of whom we lost in the year 2012. Huge posters bearing photographs and quotes from these masters decorated the path from the gate to the theatre entrance. It was indeed a fitting tribute to these great men. Rudraprasad Sengupta, the seventy eight year old thespian and the director and president of Nandikar, claims that this festival is the festival of all theatre lovers of Kolkata. Nandikar only provides the labor. From December 16 to 25th, a total of nineteen plays were staged this year. 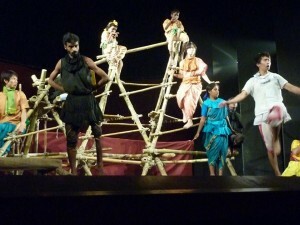 The plays came from all over the country as well as from Bangladesh. I managed to see quite a few, but not always the plays I wanted to. On the very first day, I landed up at the festival venue quite early and got myself a ticket for the matinee show. The Academy compound was teeming with theatre aficionados and I got to meet few of them. Arumoy Banerjee from Doordarshan was there with his camera crew. 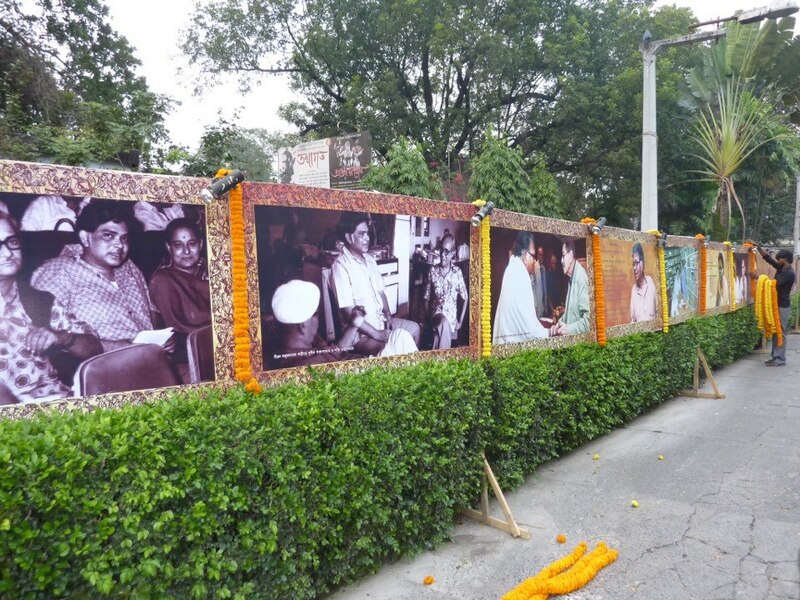 Anandalal, the noted theatre critic was there, so was Bijoy Lakshmi Burman, Ashok Vishwanathan and many others. People were buzzing about how wonderful the opening play that morning was. “Romeo Juliet and Seven Clowns”, a Hindi play by CEVA Drama Rep. Co., Chandigarh, apparently won the hearts of all those who came early that morning. I had the ticket for the afternoon staging of “Ram Sanjivan Ki Prema Katha”, another Hindi play by D for Drama, Mumbai. The play was about a young man named Ram Sanjivan who comes from a village to study at a city University, gets involved with politics and then falls madly in love with a beautiful girl student and loses his mind. The play did not impress me at all and I was kind of disappointed with my luck. The opening ceremony was supposed to be held next, but I had to leave to attend another business. The next play I saw at the festival was on the 23rd of December. Earlier I had heard of the play “Tathagata”, the last play written by Mohit Chattopadhyay and produced by Rangapat of Kolkata. So I was quite curious to see this play. Tathagata, as the name suggests, is a biopic on the life of Gautam Buddha. However the three hour long play covered the later half of his life, after he achieved his enlightenment and became Buddha. The problem with most biopics are that they show only the highlights of a long life and hence often lack the continuity between the episodes. Besides, when the central character does not traverse a character arc driven by conflicts, the drama tends to sag and lose its tension. “Tathagata”, although was a well executed play with gorgeous stage sets and costumes, but the lack of drama made the play seem to be too long. As I was leaving the theatre after watching “Tathagata”, I met Panchu-da (Panchu Roy). 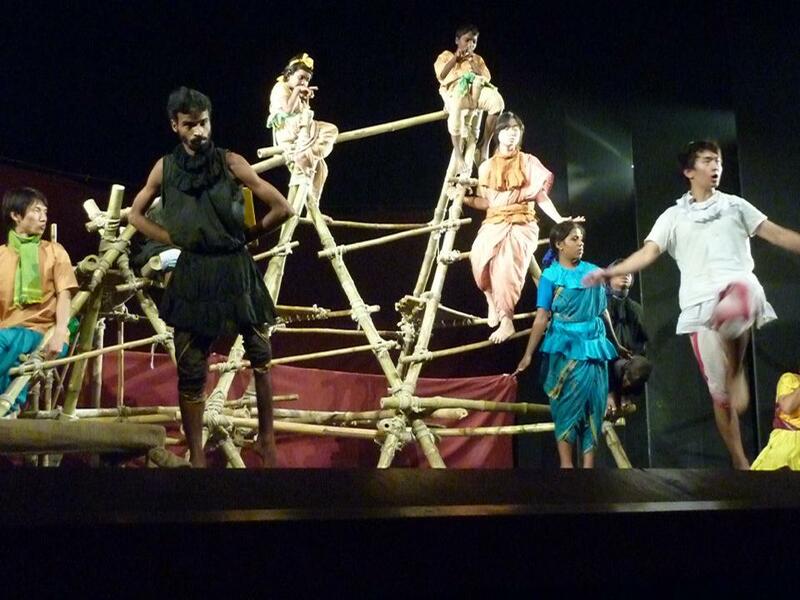 He suggested that I should watch the next play too, a Oriya play named “Chring Chring” directed by Subodh Pattanayak. He said, Subodh has been doing wonderful work and I should not miss it. Since I had nothing to do that afternoon, I stayed back. Panchu-da even managed to get a complimentary ticket for me. The play had an wonderful ensemble cast who told the story of a bird couple who was bullied by a raven. The play told this allegorical story in a form which I felt would have more suited in an outdoor setting, rather than in a proscenium stage. 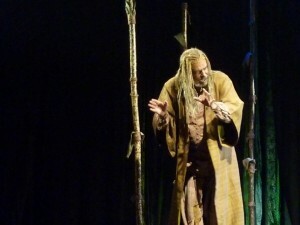 The folk form used in the play was suitable for a more open space. The actors studied animal and bird behavior quite well and the subtle differences between the species were remarkably well established. I was back again at the festival on the final day to see Nandikar’s acclaimed production, “Madhabi”. The show was sold out weeks ago, hence I had to ask my good friend Debshankar (Haldar)to help me in getting a ticket and he was kind enough to get one for me. “Madhabi” was indeed an excellent production. The play, written by Bhism Shahni, was directed by Swatilekha Sengupta. Based on a story from the Mahabharata, the play is about Yayati’s daughter Madhabi and her beloved Galab, a disciple of Rishi Vishwamitra. The play questions the age old tradition of our Indian system of using women only as a commodity to be used by men to achieve their selfish goals. Hence Madhabi had to give up her love and her identity to satisfy the wishes of her father, her lover and her innumerable husbands just because she was bound by the duty of being an woman. 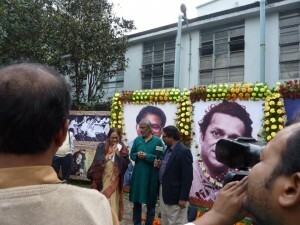 The cast included Rudraprasad Sengupta, Sohinee Sengupta, Debshankar Haldar, Partha Pratim Deb, and many others. The wonderful music composed by Swatilekha Sengupta and rendered by Mayukh-Mainak and Partha Pratim Deb was another asset of this production. At the end of the festival Rudraprasad Sengupta gave us a detailed account of the work that went into organizing the festival as well as the detailed financial account. The bottom line highlighted a huge loss after accounting for all the income and expenditure. It is a pity that a theatre festival of this magnitude hardly receives any major corporate sponsors. In the coming years I hope more sponsors rally up behind Nandikar and evolve this festival from a National Festival to an International Theatre Festival.